Victoria has formally pledged to sign up to China's controversial One Belt, One Road initiative in a deal the state hopes will generate more trade and jobs..
Premier Daniel Andrews and Chinese ambassador to Australia Cheng Jingye finalised a memorandum of understanding this week, making Victoria the first and only Australian state to support President Xi Jinping's global trade initiative. China's Belt and Road Initiative (BRI) is a massive global network of infrastructure projects that seeks to revive the Silk Road by creating two modern transit and trade corridors between China and Europe. 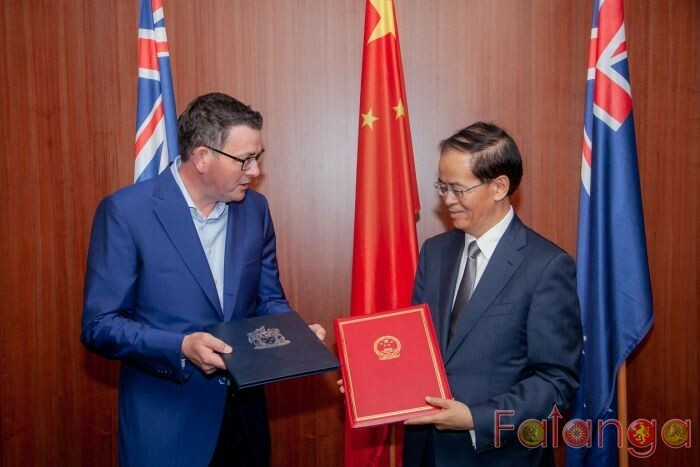 "This new Australian-first agreement sums up everything we have achieved with China over the past four years — it means more trade and more Victorian jobs and an even stronger relationship with China," Mr Andrews said. "In four years we have more than tripled Victoria's share of Chinese investment in Australia and nearly doubled our exports to China. We said we'd reboot our relationship with China and we're getting it done." Under the massive plan first unveiled in 2013, China wants to revive an ancient network of land and ocean silk trade routes and has already spent billions of dollars on new infrastructure projects for roads, railways, ports and maritime corridors.